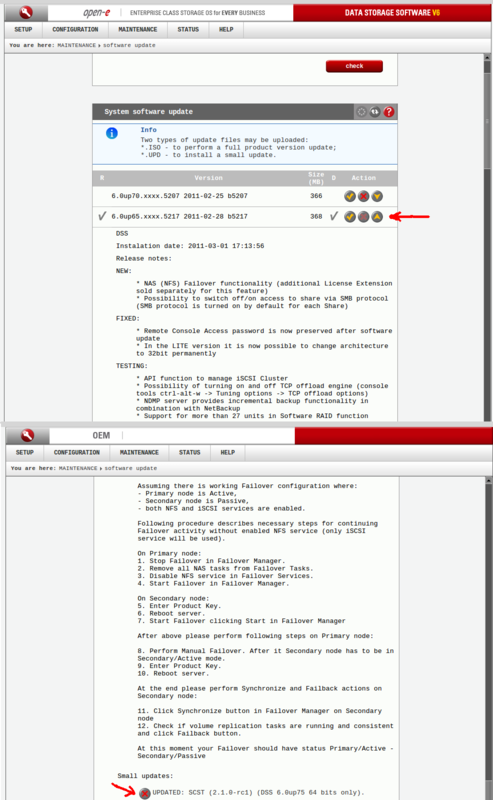 Open-E / KB Home / Information / General info / Updates / How can I obtain and apply a small update to my Open-E software? You can obtain small updates right here in the Knowledge base. Go to the Knowledge base home page. Click on Downloads in the top menu bar. Click on the Small updates link. Find the .upd file that applies to the issue you’re experiencing. You can also obtain small updates from our support after creating ticket using User portal at open-e.com. Download the .upd file and save it to a folder on your workstation. Browse to find the file you downloaded, highlight it, open it, then click ‘Upload’. Wait for the system to apply the update. Now your DSS needs to be rebooted. next to DSS V6 build that you are currently using. You see release notes for the DSS V6 that you are using. Scroll down to see the 'Small updates' section. Press the button with red 'X' sign to remove the small update. Now your DSS needs to be rebooted to apply all changes. Updated: 25 Jan, 2018 by Stolarczyk M.